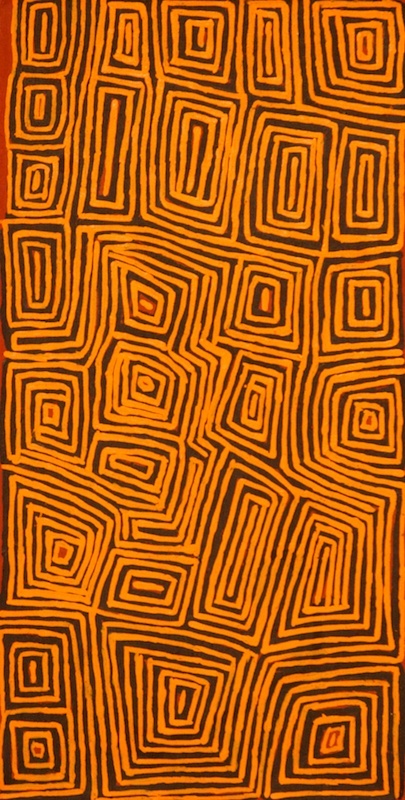 Kenny Williams Tjampitjinpa began painting for Papunya Tula Artists in 1988. "Kenny is a perfectionist when it comes to painting. He works slowly and carefully on his canvases, delicate precise lines in gentle zigzags of subtle earth tones, whose impact is mesmerising. He takes pride in looking after his paint and brushes like the old artists" (Vivien Johnson, 2008). Kenny Williams was born near where the Kiwirrkura Community now stands c. 1950. When he was still a boy his family moved to Papunya, taken in by the patrol officer Jeremy Long. Kenny was Chairman of Papunya Tula Artists for some years before Joseph Jurra Tjapaltjarri replaced him in 1999. In 2000 Kenny Williams won the 17th National Aboriginal and Torres Strait Islander Art Award. He has appeared in numerous group exhibitions since 1994 and has work in the Museum and Art Gallery of the Northern Territory as well as the Art Gallery of New South Wales.